Charming house located in Capbreton (Hossegor Limit), on 2 levels, quietly among the pines, comfortable, 6 persons, with private garden and fenced 400m2. It is more than 140 m2; consists of 3 bedrooms + 1 possible mezzanine, 2 bathrooms, one with bath, 1 separate WC, 1 kitchen with direct access onto a covered terrace, 2 living rooms (up and down). She is very nice, well decorated, bright and modern. Located 1 minute from Golf d'Hossegor, 5 minutes from the harbor, ocean and beaches, shops and the marine lake of Hossegor. • The upper bedroom is about 30m2, 1 double bed 140 cm, with bathroom, storage, seagrass on the ground. • The lower bedroom is 12 m2, 1 double bed 140 cm, with wardrobe and drawers, parquet floor, and door window to the outside. • The other bedroom downstairs is 20m2, 2 small beds of 90 cm, with very large wardrobe, dresser and desk, parquet floor. 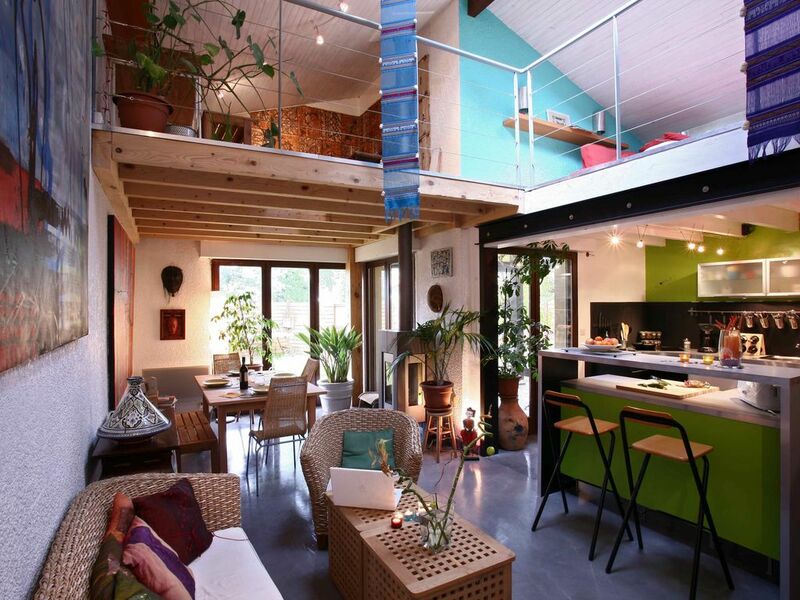 • Two more beds are possible on a 2-seater sofa bed on the mezzanine. Elle est assez spacieuse et bien décorée avec un agencement facile à vivre. We had a wonderful time in this house! Great location and a nice enclosed garden. Thank you Elisabeth. La description de la location et de sa situation était précise. La location est tranquille - emplacement idéal pour les achats quotidiens et l'autoroute. Spacieuse maison - ambiance agréable, vous vous sentirez rapidement chez vous. La location était propre, bien entretenue e bien équipé avec tous les ustensiles de ménage. Location a recommander à un ami ! The sea, the center of the Landes forest and the wild coast. Privileged location between forest and ocean, 20 minutes from Bayonne and 45 minutes from Spain and its tapas bars.